The proponents argue that the conventional off-the-plan development model is largely failing to address people’s expectations of quality and aspirations for the community. To combat this, the team at MAKE have spent the past three years working on a proprietary development model to improve housing affordability. This follows the successful delivery of over $2 billion worth of development over the last 15 years and complements their current portfolio of over $1.5 billion of urban renewal projects. MAKE undertook research of build-to-rent markets and operators in North America and Europe, before engaging KPMG and Arnold Bloch Leibler (ABL) to help refine a financial model that delivers sufficient long-run annualised investment returns to ultimately attract direct investment from superannuation funds into the Australian housing market. The model is an adaptation of the built-to-rent model with one of the key distinctions being that the liquidity event is via a sale to residents individually, rather than selling the asset in one line to an institutional investor. Following refinement of the model, MAKE identified the need for a deep community and service offering to enhance the proprietary nature of the model and underpin equity in the brand. Enter Assemble, a residential developer focused on small footprint projects and the culture of living closer together, who over the last six years via its Assemble Papers publication, has explored the culture of living closer together a wide spectrum of fields, and in turn developed a large community of passionate and loyal followers. 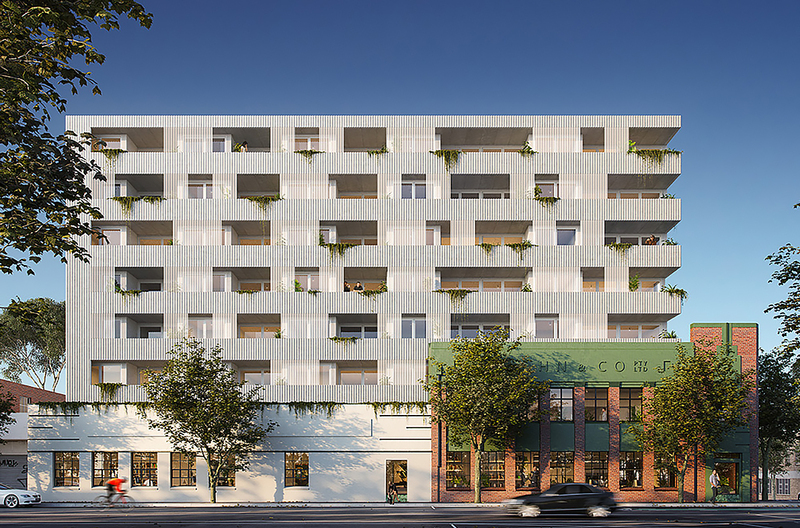 More recently, Assemble put these ideas into practice through its first development in partnership with Wulff Projects and Icon Developments in Roseneath Street, Clifton Hill, comprising 48 apartments and 18 townhouses. Assemble led the community engagement, design presentations and sales process contributing towards a record result with 80% of homes sold on the first day of sales, 95% of which to owner-occupiers and 60% of which were from the Assemble Papers reader community. The project received the 2016 Victorian Premier’s Design Award for excellence in Service Design and construction for the project is on track for completion in August 2018. Once it was determined that the two brands shared common goals, values and provided complementary skills, MAKE restructured and took a majority interest in Assemble. This provided it with the capital and infrastructure to become an end-to-end property developer and community manager, and as a result, the brand for the new development model will fall under the Assemble banner. With the first project underway and site acquisitions pending, the medium to long-term plan for Assemble is to develop and manage a portfolio of up to 40 residential assets totalling approximately 4,000 homes across major capital cities, providing a platform for institutional investment into residential housing and a pathway to home ownership for those currently locked out of the inner-city housing market. The first project to be delivered under the Assemble Model will be 393 Macaulay Road, Kensington. Located three kilometres north-west of Melbourne’s CBD in the wide, tree-lined streets of the industrial suburb, the building is sited between Moonee Ponds Creek to the east and the Maribyrnong River to the west and has been designed to encourage and foster a new community. 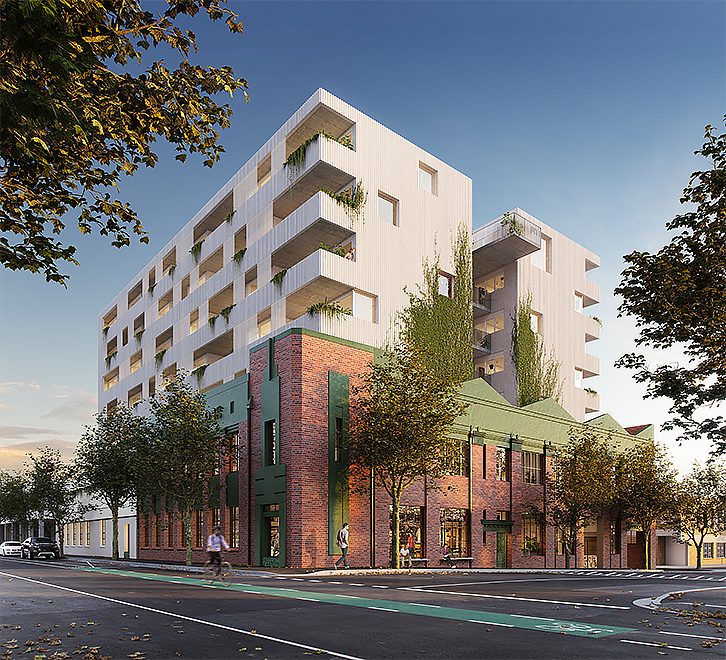 Following extensive consultation with the City of Melbourne, a town planning application has been submitted for the Fieldwork-designed building, which will upon completion comprise 73 apartments over 8 levels. ANZ has approved its first development and investment facility for the Kensington project, whereby it will provide construction funding without the usual pre-sale requirements. The design is centred around a landscaped, open-air walkway that will provide apartments with cross-flow ventilation and dual aspect natural light. The entire community will be connected through communal spaces on the upper and ground floors which include places for work, eating and leisure. Additionally, the design team at Fieldwork has adopted a "less-is-more approach with the design, where quality is the defining factor." The aim is for the building to improve with age through durable materials, flexible spaces, good access to natural light, cross-flow ventilation, strong connection between indoor and outdoor spaces, high-quality fixtures and fittings, robust energy systems and integrated landscaping. At its core, 393 Macaulay Road is about implementing a clear set of standards that promote a better quality of life, while also allowing residents a greater degree of customisation than the market currently offers. The original heritage building, designed by art deco architect Harry A. Norris will be restored and the facade retained, embedding the design within its industrial context. Prior to construction, residents sign a 5-year lease with the option to purchase their home for a fixed price at the end of the term. The purchase price is agreed up front and is calculated as today’s price with fixed 1.75% increases per year until you buy in approximately 7 years (i.e. 2 years of building and 5 years of leasing). Rent is agreed up front for the term of the lease and is calculated at a market rate with fixed 2.5% increases per year over the 5-year lease. The lease and option to purchase is secured by paying a refundable amount of 1% of the purchase price prior to the start of construction (e.g. $5k for a $500k apartment). Over the 5-year lease period, Assemble will support residents on their pathway to ownership via not-for-profit financial coaching services and bulk-buying initiatives to leverage economies of scale (e.g. internet, utilities, farm-direct groceries, insurance), Assemble will also have an on-site team to help with the day-to-day chores (e.g. parcel pick-up and drop-off, dry-cleaning, dog walking and apartment cleaning) and community building initiatives. After 5 years, residents can exercise the option to purchase the property at the fixed price, with the 1% refundable amount contributing towards the purchase price. The Assemble Model is the culmination of three years of research, both locally and overseas - and applying these learnings to the Australian context. The model aims to address the fundamental desire for the majority of Australians to own their own home – and is a direct response to multi-level government policies on housing affordability. Any increase in the market value of your home above the fixed price, is to your benefit. It’s about giving people an opportunity to get a foothold in tomorrow’s housing market today. What excites me in particular about the Assemble Model is a greater alignment of interest between the developer and resident compared to the off-the-plan model. We have to deliver high quality buildings that age gracefully and foster a genuine community. Design will be at the forefront of the Assemble Model to create homes that are functional and beautiful and that we’d genuinely want to live in ourselves. Having designed many high quality apartment projects over the last 17 years, I’ve been frustrated that a lot of my team members can’t afford to buy into the projects they’re working on. I’m excited that the Assemble Model will provide them with the opportunity to do so in a supported and flexible way. A tight-knit community doesn’t just grow overnight. We believe that with the right community infrastructure in place - we can support our residents to build strong relationships with their neighbours. I am interested in a home of my own as I am approaching retirement age and still renting .